My wife is a direct descendant of Jacques Wissler, and we, along with our daughter and granddaughter from NJ, are planning a visit to Philadelphia in a couple of weeks. We understand you have a collection of his prints, memoir, etc. in your library. Would it be possible for us to arrange to come visit to see these? 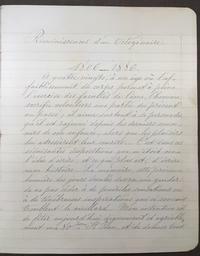 A brief search of our digital collections came up with no results for Jacques Wissler. Our next step was to search the card catalog of our Fine Art Prints Collection. Bingo! 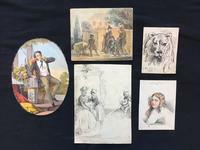 In our alphabetical cards of artist’s works, there was a card for "Wissler, Jacques" with the note "Special Collection" and the location. 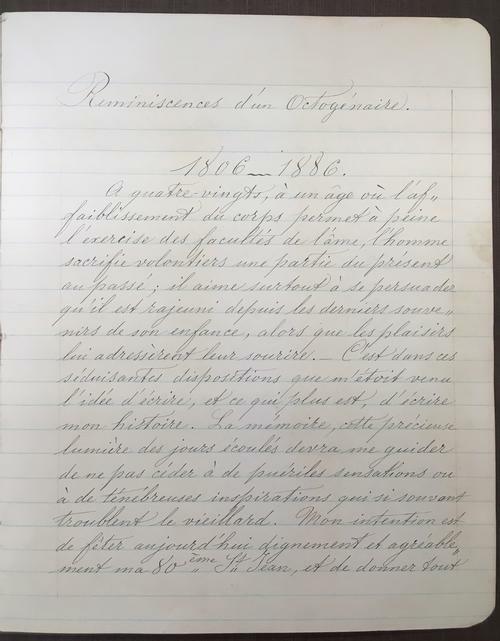 We retrieved the box and found a collection of prints, drawings, and biographical information, including a handwritten memoir in French. These items were given to the Free Library of Philadelphia in August 1971 by the granddaughter of Jacques Wissler, who entrusted us to care for the 100 items in the box she had labeled "Grandfather's Papers." We alerted Jacques Wissler’s family that we did indeed have the collection and scheduled a research appointment for the family to see their ancestor’s work. Jacques Wissler was born in Strasbourg, France on June 25, 1806, and immigrated to Philadelphia in 1849, where he worked as an artist and lithographer for P.S. Duval for about ten years. He moved to Richmond, Virginia just before the Civil War broke out and remained for the duration. He was required by the government of the Confederacy to engrave banknotes and other Confederate documents, and was referred to as the "lithographer of the Confederacy." After the war, his family relocated to Macon, Mississippi, and he eventually returned north to Camden, New Jersey, where he died on November 26, 1887. Robert F. Looney, head of the Print and Picture Collection when the Wissler Collection was donated to the library, contributed an article about Wissler to the American Historical Print Collectors Society’s (AHPCS) scholarly journal, Imprint, in Spring 1982. Jacques Wissler, Painter and Printmaker includes an entire translation of the handwritten memoir, a description of PIX’s collection, biographical information, and some examples of Wissler’s work. It was actually an abstract of Mr. Looney’s article on the AHPCS website that prompted our patron, Charles Kuttner, to contact the Free Library. His wife Donna C. Holberg Kuttner is Jacques’s great-great-granddaughter, and her brother, Douglas Holberg, found the abstract of the article while doing genealogical research. Charles and Donna traveled from Portland, Oregon to visit their daughter Arwen Kuttner in New Jersey. Charles, Donna, Arwen, and Arwen’s ten-year-old daughter, Naomi Ruttenberg—three generations of Jacques Wissler’s descendants—visited the Print and Picture Collection to see the collection that the library has housed since 1971. 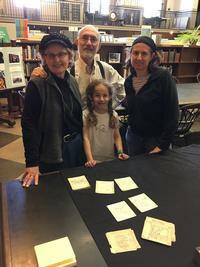 The Kuttner family is pictured at right, looking at their favorite items in the collection—several packets of small ink drawings illustrating scenes from children’s literature such as Robinson Crusoe, Cinderella, Little Red Riding Hood, and Seven League Boots. Also pictured are the title page of Jacques’ memoir, Reminiscences d’un Octogénaire, (translated in Mr. Looney’s article) and a selection of his work, including a chromolithograph, drawings, and watercolors. With the help of dedicated volunteers and staff creating digital records and scanning images, we hope to be able to add images from the Wissler Collection to the digital collections soon.